Tomatoes and red wine add wonderful flavor to this delicious beef stew. Use lean stew beef or cut a lean chuck roast into small cubes. Feel free to use rutabaga or turnip, or replace with carrots or parsnips or more potatoes. 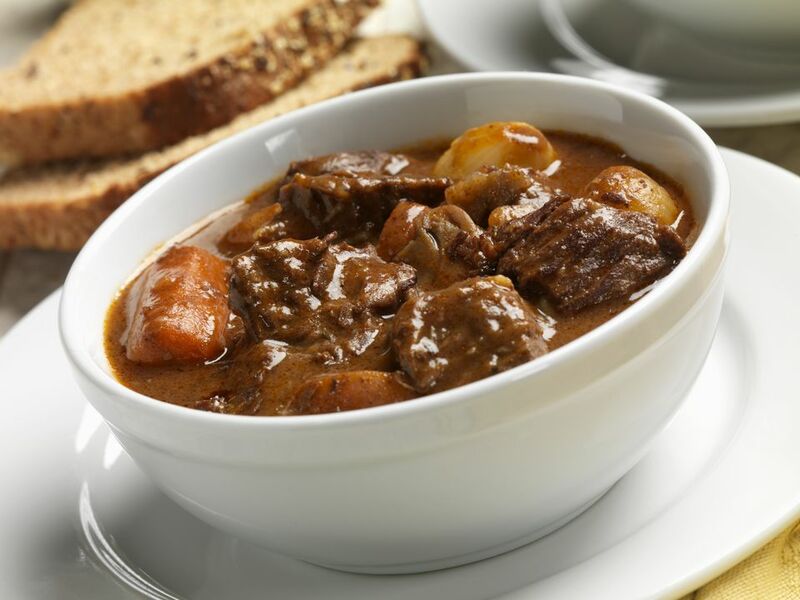 Serve the stew with freshly baked biscuits or warm, crusty bread. Combine the 1/3 cup flour, salt, and 1/4 teaspoon of pepper; toss with the beef pieces until well coated. In a large Dutch oven or saucepan, heat the olive oil over medium heat. Add the beef and cook, stirring, until browned. Add the onion and celery and continue cooking until the onion is softened. Add the garlic, tomatoes, wine, and beef broth. Bring to a boil; reduce heat, cover, and simmer for 1 1/2 hours. Add the 1/2 teaspoon of pepper, thyme, potatoes, carrots, and rutabaga or turnip. cover and simmer for 35 to 45 minutes longer, or until vegetables are tender. Add the flour and water mixture and continue cooking, stirring, until thickened. Ground beef is another option for this stew, and it would cut the cooking time significantly. Brown ground beef for this stew and then follow step 4 and simmer for 10 minutes. Add the seasonings and vegetables and proceed with the recipe.